As planned within FORESDA project (Interreg Danube Programme) project, the Transnational Strategy on the fostering of cross-sectoral, transnational innovation and strengthening of ecosystems is released in the end of December 2017. 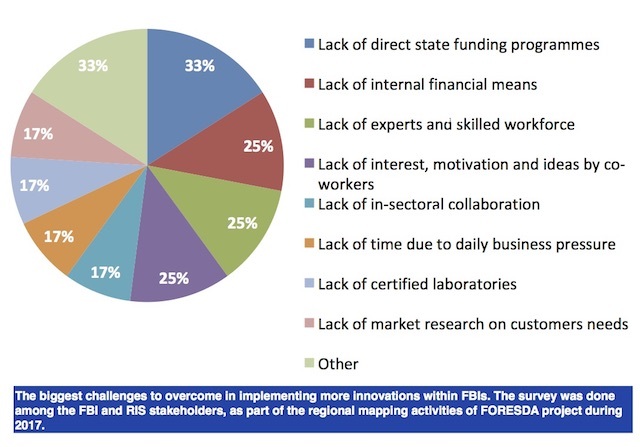 The Strategy lays out the plan that should open up, broaden and contribute to the further development of the forest-based sectors' (FBIs) research innovation system, and in particular develop new sources of innovation and strengthen the networking capability of the participating actors and organizations. The expected impacts of the Transnational Strategy go beyond a period of five years because of the planned transferability and durability of the project outputs, which is especially emphasized through the Local Action Plans (LAPs) for improved technology transfer and innovation processes in SMEs of the forest-based sector defined for each project region, which should be in coherence with the Transnational Strategy, then the LAPs will be defined for the duration of the project, with clear operational objectives.